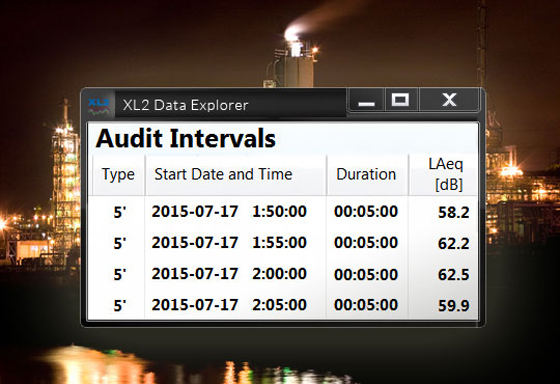 The XL2 Data Explorer software is designed to quickly analyze and report on large measurement datasets. This is particularly useful, for example, when applied to a long-term sound level measurement contract. Version 1.40 of this software package provides a few new tools you may find very useful indeed; the software now allows you to define or change the audit interval after the measurement and will recalculate the equivalent values. Based on these audit intervals, you can now also add percentile levels to your graphs and reports, greatly enhancing your analysis capabilities. The XL2 is designed to simultaneously measure many data values and an audio track over long periods of time. This often results in large data files. For this purpose the Data Explorer software provides the professional solution for rapid visualization and detailed analysis of the measurement data. All data is plotted on an overview graph. You can quickly zoom to individual data points, and audio data is appropriately synchronized with the graphed data points for audible verification of the sound source. XL2 measurement data is written in plain text to files. These files can be directly imported into spreadsheet programs such as Microsoft Excel. This is most suitable for simple evaluation of small datasets. For larger contracts and professional report templates, NTi Audio recommends the Data Explorer software. Standards often define that noise measurements be reported as the mean and the maximum sound level within defined time periods (audit intervals) e.g. 5, 10, 15, 30 or 60 minutes. Version 1.40 of the Data Explorer allows you to change the audit interval period after the measurement is completed and recalculate the broadband, third-octave and percentile levels for each interval. In addition, with the Data Explorer graphic interface you can highlight and report on equivalent values for individual sound events and periods. The colors of the scale used in the spectrogram can now be set as desired. Further, when importing data files into the software, you can choose multiple files simultaneously. These new features added to the already-powerful Data Explorer software provide acousticians with a real added value for the efficient creation of measurement reports in support of their professional opinions. Data Explorer software V1.40 is free to download for all XL2 customers and can be installed on as many PCs as you wish. The process to import data from an XL2 Sound Level Meter into the software requires that an option be installed on the XL2.